Some of the biggest names in multisport are in New South Wales, Australia for Saturday’s second annual XTERRA Asia-Pacific Championship race at Callala Beach in Jervis Bay. 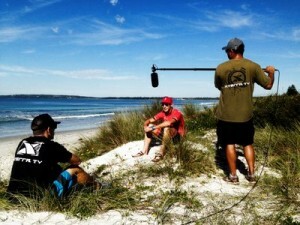 Callala Beach, Jervis Bay, NSW (April 16, 2015) – Some of the biggest names in multisport are in New South Wales, Australia for Saturday’s second annual XTERRA Asia-Pacific Championship race at Callala Beach in Jervis Bay. Two-time Olympian Courtney Atkinson, the runner-up last year, is the top returning men’s elite competitor following the retirement of 2014 champion Dan Hugo of South Africa. Atkinson will have plenty of competition highlighted by the most successful off-road triathlete of all-time, Conrad “The Caveman” Stoltz from South Africa, local athlete Ben Allen (Wollongong, NSW) and New Zealander Braden Currie. Currie, who was third last year, comes in fresh off an impressive victory at XTERRA New Zealand in Rotorua last weekend and on the heels of his third straight Coast-to-Coast Adventure Racing World Championship. NSW Minister for Trade, Tourism and Major Events Stuart Ayres welcomed athletes including Braden Currie to New South Wales this week, ahead of the event. As the most prestigious event in the Asia-Pacific series that includes championship races in Australia, New Zealand, Malaysia, the Philippines, Japan, Guam, Tahiti, and Saipan – the XTERRA Asia-Pacific Championship boasts the second-largest prize purse in off-road triathlon at $50,000 AUD, and will be filmed and edited into a TV show to be seen by millions worldwide. The main event combines a 1.5-kilometer ocean swim at Callala Beach, approximately two and a half hours south of Sydney, with 30-kilometers of mountain biking followed by 10-kilometers of trail running. Atkinson was the top Australian finisher at last weekend’s ITU World Triathlon Series (WTS) race in Queensland, and well on his way to securing his spot on the national team for yet another Olympic Games in Rio next summer. Allen, who placed third at the XTERRA World Championship in each of the last two years, won XTERRA Guam last weekend and XTERRA Saipan before that. Since 2011, the 30-year-old has captured 16 XTERRA majors in Brazil, Saipan, Guam, Australia, New Zealand, Malaysia, Greece, and England. Meanwhile, Stoltz is a 15-year-veteran of the sport and seven-time world champion. In the women’s race, reigning XTERRA World Champion and two-time Olympian Flora Duffy of Bermuda is back to defend her title and in prime form. The 27-year-old won the first two XTERRA majors of 2015 in the Philippines and South Africa and has now won nine of the last 10 she’s entered including the XTERRA USA, Asia-Pacific, and World Championships. Duffy has also performed well on the road, placing fifth at the ITU WTS race on the Gold Coast last weekend, and third in Abu Dhabi earlier in the year. There are plenty of fast women ready to give chase as five of the top 10 females from last year’s XTERRA World Championship are on the start list including runner-up Barbara Riveros from Chile. Riveros, who has made her base in Wollongong since 2007, says she’s excited to mix XTERRA in with her strenuous schedule trying to qualify for Rio. American Suzie Snyder is fresh off a win at the XTERRA New Zealand Championship and seems as fast as she’s ever been. Jacqui Slack, who was third at the XTERRA Asia-Pacific Championship last year, is one of several racers coming off three weeks in the Marianas for the XTERRA Guam and Saipan races. Slack won XTERRA Saipan, while Austrian Carina Wasle won XTERRA Guam. Four-time XTERRA European Tour Champion Renata Bucher is also in the mix, and Kiwi Lizzie Orchard comes over from XTERRA New Zealand where she was second behind Snyder. The wildcard in the women’s race is Ironman star Caroline Steffen who will be racing in her first-ever off-road triathlon, however, the winner of IM Australia (2011), Challenge Roth (2013), two ITU Long Course World Championships (2010/12), two IM Asia-Pacific titles (2012/14), and two Ironman European Championships (2011/12) said she is no stranger to mountain biking. “I was an outdoor kid from a young age and before I started with triathlon I spent most of my time on the mountain bike exploring the Swiss Alps,” said Steffen, who grew up in a small village in Switzerland surrounded by mountains. Steffen has made Mooloolaba her home base for six years now but having never visited Callala Beach before said she’s looking forward to discovering the beauty of the New South Wales South Coast. The XTERRA Asia-Pacific Championship is proudly supported by the NSW Government through its tourism and major events agency, Destination NSW. Presenting sponsors include John Paul Mitchell Systems, the world’s largest privately owned professional salon hair care company, Outrigger Resorts – one of the largest and fastest growing privately-held leisure lodging, retail and hospitality companies in the Asia-Pacific and Oceania regions, 220 Triathlon Australia/NZ, and XTERRA Wetsuits & Boards Australia – the official swim sponsor.